This is the latest release on the Sulatron Records label. It is a limited edition CD-r in an edition of 100 copies. 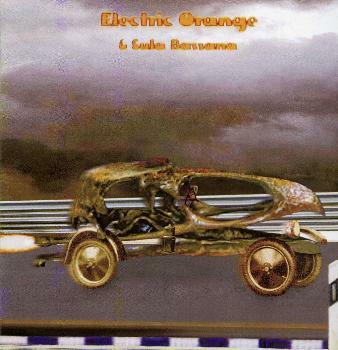 Many of you may have heard of the German Krautrock band, Electric Orange, who play a variety of styles of instrumental music, but mostly experimental and spaced out. The band has a lot of releases as CD-rs, mostly on their own label, as well as several vinyl records. Sula has played with a lot of people and bands and is on bass on this recording (with lots of effects!). We have 3 tracks featured here (32, 30 and 8 minutes). Vogelauto starts things off very slow and spacey and hypnotic as the music slowly builds up and the organ gets more intense and the guitar really kicks in. After 10 minutes it gets really spaced out for a while with far out sounds. From about 20 minutes to the end it becomes less interesting. Abschnelden is next for another 30 minutes and begins as weird off-beat grooves with the guitar just coming in here and there before a stable track forms some 15 minutes later. This is a totally tripped out track with only the bass and drums (some of the time) being stable and all else in flux. Wischwasch ends the CD and is a very cool jam with a very heavy bass and hypnotic stoned playing. Far out experimental stuff. For more information you can visit the Sulatron web site at: http://www.sulatron.com. Visit the Electric Orange web site at: http://www.electric-orange.com.